SITUATION: Vernon Road is a small road of similar style homes centrally located within Tunbridge Wells and in particular within the popular St James' area. Within the locality there is a large park which has undergone extensive improvement and a selection of schools catering for a wide range of age groups. Tunbridge Wells town centre is approximately three quarters of a mile walking distance where you will find most of the High Street retailers contained within the Royal Victoria Place Shopping Mall and Calverley Road Precinct. A further half miles walking distance in the southern part of the town you will find the old High Street, historic Pantiles and Tunbridge Wells main line station. For the commuter traveller there is also a choice of a second station at High Brooms with both Tunbridge Wells and High Brooms having commuter services to London Bridge, Cannon Street and Charing Cross. Recreational amenities include a wide selection of sports and social clubs including golf, rugby and cricket, whilst out of town Knights Park Retail Centre has a multi screen cinema, bowling complex and private health club. SITTING ROOM: A cosy room with feature fireplace and open fire, window to front, beams to ceiling, wood effect laminate flooring, radiator. KITCHEN/DINING ROOM: A range of wall and base units with complementary wooden worktop, built in fridge/freezer, space for range cooker (or available by separate negotiation) with extractor fan over, part tiling to walls, windows to rear and side with shutters, under counter lighting, two under stair cupboards, wood effect laminate flooring, radiator. UTILITY: Also with wall and base units, inset sink and drainer with mixer tap, space for washing machine and tumble dryer, built in dishwasher, double glazed window to side with shutter, laminate flooring. BATHROOM: Panelled bath with shower over, folding shower screen, wash hand basin with cupboard under, low level WC, part tiling to walls, heated towel rail, double glazed window to side, part tiling to walls, extractor fan, down lights. 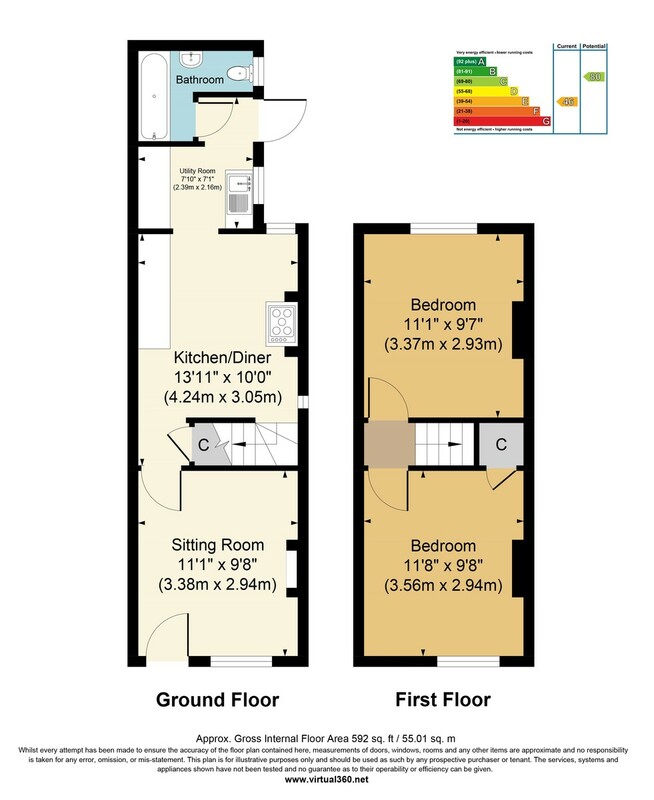 BEDROOM: A double bedroom with window to front, built in store cupboard housing wall mounted gas central heating boiler, wood effect laminate flooring, radiator. BEDROOM: A further double bedroom with sash window to rear, wood effect laminate flooring, radiator. GARDEN: A pretty garden with brick paved path way, gate to side giving access to front of property and neighbouring properties access for bins etc, lawn area, shed, fencing to boundaries, shrubs to borders.